Somewhere in the middle of the sixteenth century, Christmas was banned in Scotland. The country was mainly protestant at the time, Christmas was seen in Scotland as a Roman Catholic holiday - and celebrating it was obviously unacceptable. The banning of Christmas was a very serious affair: there were plenty of legal repercussions for people who celebrated the birth of Christ anyway. Only in the 1950s was the ban lifted, and Christmas became a national holiday in 1958, though many Scots still think it is highly unacceptable to make a big production out of the occasion. Before the 1950s, the Scottish used to celebrate New Year - a holiday they call "Hogmanay". Linguists point out that this word may actually derive from the French expression "un homme est né" (meaning "a man is born"), which would then link their celebrations to Christmas after all. There used to be a long standing superstition that one absolutely had to keep the fire going in the fireplace on Christmas Eve. If not, the sprites that were roaming around outside would climb down the chimney - and apparently, you didn't want that to happen. It is worth noting at this point that pagan traditions were still very much a part of popular Scottish culture. Another (once clandestine) custom is the burning of the Yule log: a log of birch wood is cut by the end of the summer and left to dry. It is then ceremoniously brought inside the house on Christmas Eve, paraded around the kitchen three times, toasted to and finally burned in the fireplace. The Scottish even have their own Christmas desserts, the traditional "Bannock" is an oatcake; the Selkirk Bannock is a fruit cake - more akin to what we might call a "traditional" Christmas cake. Much of Scotland has historical links with the Vikings - Shetland's "Up-Helly-Aa" being a typical hangover (in more ways than one!) from those old days and today Mid-Winter fire festivals are a big thing in the far north. Having been deprived of Christmas celebrations until a time when the mass media were already firmly in place has meant Scottish holiday customs have become heavily influenced by foreign traditions (mainly US and England). That's why the Scots now eat a turkey dinner on Christmas Day with all the trimmings. Exchanging gifts has become customary, too, just like visiting friends and relatives. There are traditional Christmas trees (most likely Scots pines), adorned with all kinds of shiny and twinkling stuff. 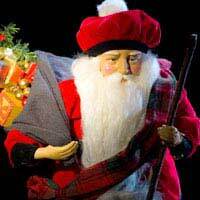 Unlike in the past when Santa Claus would visit the first day of the New Year - Hogmanay, Santa has moved with the times and visits Scotland late Christmas Eve and the early hours of Christmas Day. Christmas Day being celebrated in Scotland on the 25th December.